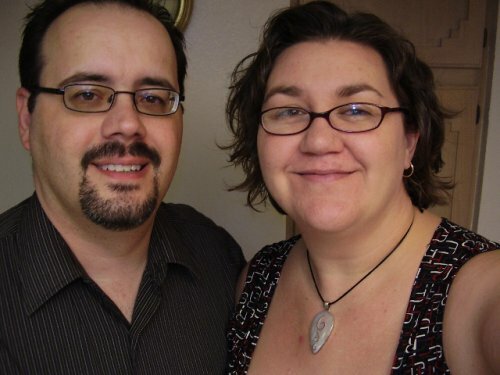 This picture was taken on our 14th wedding anniversary last year. &bsp;Scott and I met through a personal ad in our university newspaper back in 1990, when I was just 18 years old. &bsp;We've been together ever since; I've spent half my life with him now. &bsp;When I met Scott, he was really really skinny, and while I was thinner than I am now, I was not. &bsp;I thought I'd break him every time I hugged him, but that never happened. &bsp;I thought he couldn't possibly find me beautiful, no matter what he said. &bsp;That didn't change until I did, but it helped to hear it, even if inside I denied it. &bsp;We've both been up and down and weight over the years; that'll happen when you've been together almost two decades; but the love has been a constant.